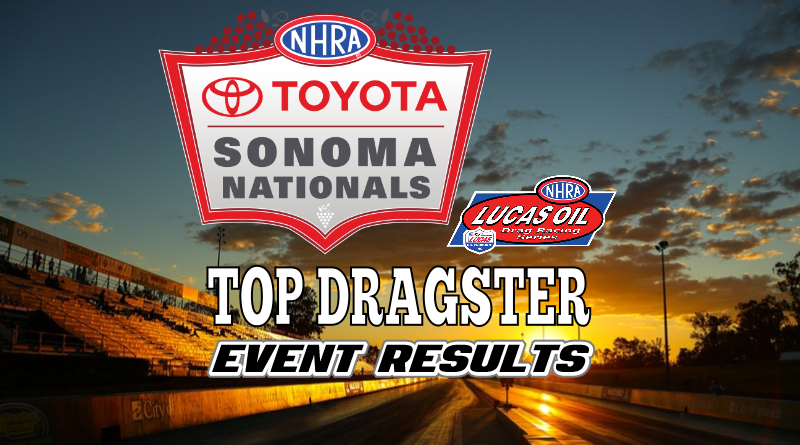 SONOMA, Calif. – John Richardson of Santa Clarita, Calif. earned his first NHRA national event victory at the Toyota Sonoma Nationals held at Sonoma Raceway. Richardson drove his low six-second dragster to the victory over a red-lighting Andy Spiegel of Acton, Calif. in the final round. Making the win more impressive was Richardson dialed six flat throughout eliminations. Richardson started his path to the final with a first round win over Dan Provost. Richardson converted his .03 reaction time advantage into a seven-foot win at the finish line when his .03 over 6.03 E.T. handled Provost’s .022 over 6.702 E.T. In the second round, Richardson survived a close race against Mark Yeager. Although Richardson was almost perfect at the line (.001 R.T.), he misjudged the finish line in killing .03 to give the stripe to Yeager. Luckily for Richardson, Yeager broke out by .002 giving the break-out win to Richardson sending him to the third round. The third round encounter with Chris Thode looked similar to Richardson’s second round race in that Richardson nailed the tree with a .014 light, giving him a .029 advantage. Richardson once again reached the finish line second by -.002. Richardson turned on the win light when Thode broke out by -.024. Richardson killed three mph to go dead-on with a seven for the win. In the semifinals, Richardson’s opponent Mark Colton missed on both ends of the track sending Richardson to his first national event final round. Colton’s .080 initiated .030 over 6.700 E.T. pass was easily covered by Richardson’s .037 package. Five time national event finalist Andy Spiegel’s near perfect round one pass easily handled opponent Tom Koenen. Spiegel’s perfect .000 reaction time lead Koenen’s .080 R.T. by a ton. Although Spiegel’s dragster was on a dead-on run, he killed 12 mph to go five above the dial for the easy win. Spiegel survived a double break-out round two encounter with David Morgan by .005. Morgan killed the tree with a .009 R.T. giving him a huge advantage against Spiegel’s .036 R.T. but it was ultimately not enough as Morgan took .032 at the stripe to go -.017 under the dial. Spiegel’s -.012 under 6.618 E.T. was closer to the dial for the win. Spiegel’s third round opponent Jeff Havens made a good lap but came up just short in the break-out loss. Spiegel posted his second .00 reaction of the event with .008 R.T. to Haven’s solid .014 R.T. At the stripe, Spiegel whacked the throttle, killing .02, in feeding a .020 stripe to Haven. Haven didn’t catch the dump as his all-out 6.715 resulted in a -.005 break-out loss. Spiegel’s .021 above 6.641 E.T. was good for the win. Spiegel’s semifinal opponent George Prather slowed dramatically down track sending Spiegel to another final round. The final was over quickly as Spiegel turned it “red” by -.005 giving Richardson the easy win. Spiegel was probably kicking himself once he picked up the time slip as Richardson had a .371 R.T. and idled down the track to a 28-second pass. Had Spiegel not fouled, he more than likely would have picked up another Top Dragster Wally. Richardson earned his first Wally using solid reaction times combined with a ultra-fast and consistent dragster. Congratulations to John and his team on their first national event win!